Uh oh. Your throat suddenly feels scratchy, you’re extra tired (although this is sometimes hard to tell), and you need to blow your nose – again. Are you coming down with a cold? As caregivers to our families we are all familiar with the signs and symptoms of a cold. 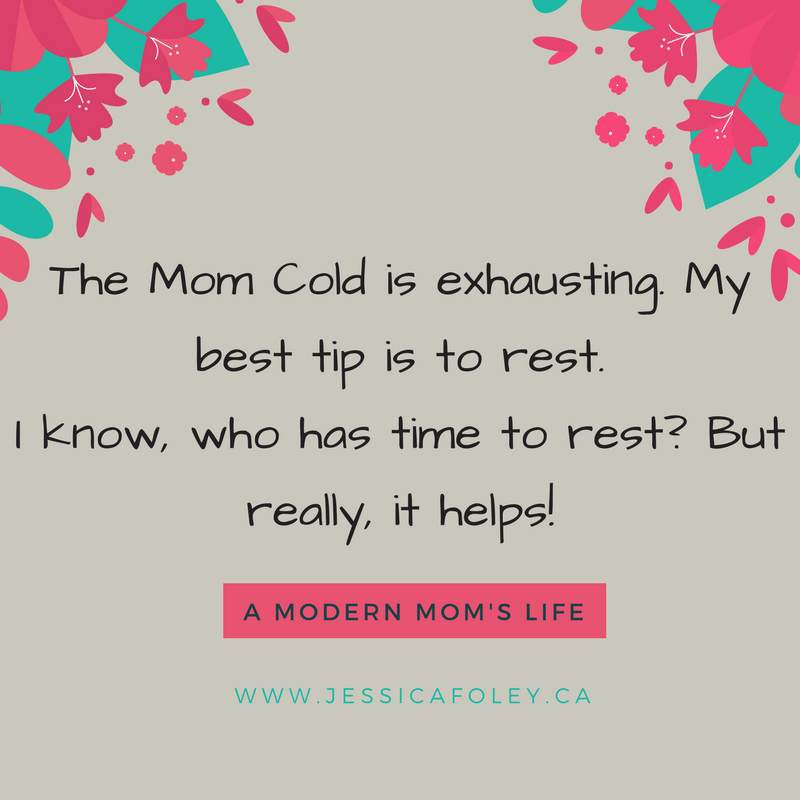 Most of us, I’m sure, have even seen evidence of the “man cold.” Today I want to talk about the Mom Cold. While the man cold is best treated with earplugs and patience, the mom cold is more difficult. Patience is definitely needed for treatment of the Mom Cold, but there is so much more going on that patience often isn’t enough. When I get a Mom Cold I usually get the Working Mom variety. So not only does my family shun me (“No kisses tonight Mama – you have a cold!”) my co-workers do as well. That always makes a person feel good, doesn’t it? Taking time off from work when you have a cold is a silly notion. Sure, it keeps you from spreading it to everyone else (even though you’re often contagious before you know you’re sick) but in reality if you stay home you still don’t rest. If I’m at home and I don’t feel like death is imminent I’m doing laundry, sweeping the floors, folding the laundry, going to the grocery store, and doing more laundry. I may take a few minutes and watch a show or read a book, but being at home with a cold is just as much work as being at work with a cold. Mom gets the sniffles and immediately checks the cupboard for decongestants, lozenges, and cough syrup, and she checks the facial tissue supply. If any of these are lacking, she goes to the store. If Mom wakes up with a splitting headache, stuffy head and runny nose she goes to the above cupboard, takes some medicine and, likely, a pain reliever and then gets the kids ready for school and goes to work. She works all day, then comes home, makes dinner (although it’s likely to be a can of soup as she’s so exhausted and uninspired), fights with the kids to eat and get ready for bed, and then dreams of going to bed herself while she cleans up from dinner, sweeps the floors, and then falls asleep on the couch. A Mom with a cold may also try to play the sympathy card. “Dear daughter, I have a such a bad cold I really don’t feel like reading a long story tonight.” “That’s okay, you can just read our regular 12 page chapter from Harry Potter tonight!” Hmm…that didn’t really work, did it? Then enter pouting, and sometimes crying, when you try to beg off halfway through said chapter because you literally can’t speak anymore, nor breathe out your nose. I think my eldest needs to work on her empathy. When Mom is able to have a few quiet minutes in the day, she may just sit with the box of tissues and a book. This is a sure-fire invitation for the kids to suddenly NEED a million things. While this is true at all times for parents, it somehow seems worse when in the throws of a Mom Cold, often because you’ve just made a cup of tea or hot water with lemon. They don’t stay hot forever. At any other time the kids can, and will, solve their own “she had it first!” issues or look for the suddenly disappeared object. If Mom Cold is in the house, all bets are off. In case you can’t tell, I’m currently in the middle of a Working Mom Cold. My co-workers are sympathetic, but sometimes I see them getting out the alcohol and disinfecting surfaces I’ve been using heavily. I try not to let that bother me, but honestly sometimes it does. And then there’s my family. They are also supportive and caring, but sometimes I just need to sit and sip my honey-lemon water in peace. Often the girls will notice if I need a cuddle or if I need space. It does break my heart when Rose says she doesn’t want a good-night kiss. “Do you still have that cold Mama? I don’t want a kiss tonight.” I kiss her cheek anyway, and I try to take solace in the fact that she understands how colds and germs are spread. She is also the one who will let me off with a super short story (sometimes) and no pouting or crying over it. She must have her empathy developed already. As far as suggestions go, I have a few to help you through the dreaded Mom Cold. Rest. I know – Moms don’t rest. But you can, and should. If you have “kids being quiet” time, don’t go do the laundry. Sit down, or better yet have a nap. This is the same tip everyone gives new moms – but that’s because it’s a good tip. You just have to train yourself to do it. I’ve had 8 years and I still struggle with this! Take the drugs. If you’re super stuffy, find a decongestant. It will make your day better. And take it on the schedule the box says. It won’t make your cold go away, but it will make you feel better. Keep those lozenges nearby (I have some in my work-shirt pocket) for that annoying tickle from the post-nasal drip! Fresh air often helps. Not sure why, but if the weather is good (and I have time) I’ll try to get outside for a 20 minute walk or something. Bonus points if it’s a sunny day as that will lift your spirits if nothing else! If you are a Working Mom, be mindful of your co-workers and all the surfaces you touch. You really don’t want to be the one who gets everyone else sick. That’s not cool. Wash your hands and/or use hand sanitizer often. But then be sure to lotion them at the end of the day as well – all that soap and alcohol is not nice to your skin. Ask for help. Again, another “new mom” suggestion. But really, get your older kid to help your younger kid with the easy stuff like getting dressed, or tidying up. Ask your spouse to make a meal. Call your parents/in-laws/friends and ask if they want to come over and amuse the kids for an hour while you rest. And really do stay home from work if you’re feeling that poorly. Busy moms love nothing more than to power through the days. We jam as much work and play as we can into the awake hours. It’s just what we do. When the Mom Cold hits you just can’t do that. What do you do when you get a Mom Cold (or Dad Cold)? Share some tips in the comments so we can help others who suffer too! Make sure you take care of yourself so you can keep taking care of all the others. This is so true, we just soldier on don’t we?! Well it’s a case of having too sometimes, as opposed to the man cold which is obviously much much worse than ours hehe! Luckily my hubby does muck in around the house and help with the kids. I definitely dose up on the lozenges and beechams when I have a cold. Thanks Jayne! It is nice when the spouse can be around to help out. Makes things easier for sure! Ugh! The kids all got sick over spring break- and then I got it. It was miserable. All four kids home all day long and me on my death bed- then we threw in a book release, a bathroom reno and three cases of pink eye! Oh my gosh! That sounds dreadful Kristin! I hope everyone is on the mend now. I send you healthy vibes!! Love your comment Iveth! I really don’t want to put Dads down, but it’s the kids – why can’t they just see you’re ill and go ask someone else? Am I right? Thanks for hosting your linky – I enjoy linking up with you!